Fuzzy Bunny Deadpool Slippers | Nerd Much? Looking for the perfect way to keep your feet comfy and cozy while simultaneously showing off your Deadpool fandom? Look no further. These ThinkGeek exclusive Fuzzy Bunny Deadpool Slippers are here! They’re the perfect combination of fuzzy bunny and mutant mercenary, and they are everything you could ask for in a slipper. Well, maybe not everything but how much are you really looking for in a slipper anyway? 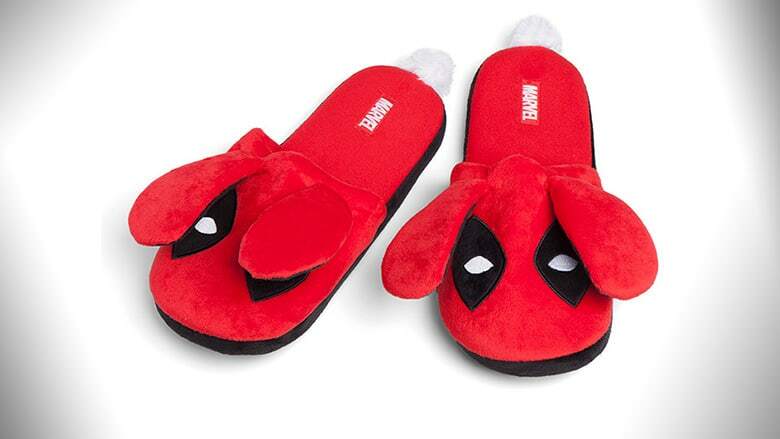 Made in the classic design of the floppy bunny slippers of yesteryear (think floppy, white, and pink), these slippers feature Deadpool with big red bunny ears and a fluffy white cotton tail on the back. Officially licensed Deadpool merchandise, these Deadpool slippers come in 2 sizes; Small/Medium (US Mens 8-9, Womens 10-11) and Large/Extra-Large (US Mens 10-11, Womens 12-13). Whether you are just trudging from the fridge to the couch, or out hunting bad guys, the no slip-dots on the bottom of these slippers help keep you from sliding around aimlessly. While promising to be fuzzy and comfortable, these Fuzzy Bunny Deadpool slippers are made from 100% man-made materials including faux-fur. So don’t worry, no fluffy bunnies were harmed to make these Deadpool slippers. They should only be spot washed with mild detergent when necessary, so keep that in mind when you are getting down and dirty. Are you looking forward to this month’s scheduled release of Deadpool 2 on May 18th? So are we. This upcoming Marvel sequel promises to be action packed, and snark filled. Check out the final trailer here. And if you need a little help remembering why Deadpool is everyone’s favorite foul-mouthed anti-hero, you can check out this collaborative music video between Deadpool and Celine Dion. You can buy these at ThinkGeek.